As part of Women’s History Month, on March 23, U.S. Chargé d’Affaires Richard Michaels honored three Rwandan women at an event at the U.S. Embassy. The three women, selected from over one thousand nominations submitted by U.S. Embassy Kigali’s 40,085 Facebook fans, were recognized with the Embassy’s fourth annual Rwandan Women of Courage award for their exceptional service and leadership. Since 2007, the U.S. State Department in Washington, DC has presented International Women of Courage awards to inspiring women from around the world who have demonstrated exceptional courage, strength, and leadership in advocating for human rights, social justice, and women’s equality and advancement. 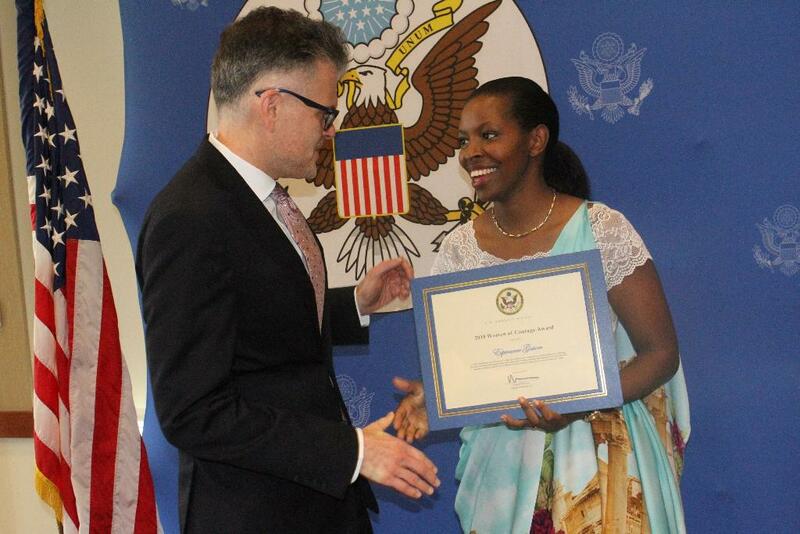 In 2015, the U.S. Embassy in Kigali launched the “Rwanda’s Women of Courage,” to recognize inspiring women of Rwanda. The 2018 Women of Courage awardees are Leonne Laura Uwizihiwe, Vanessa Bahati, and Esperence Gasore. Leonne Laura Uwizihiwe is a teacher and an advocate for gender equality. She has been a strong advocate for girls’ empowerment through mentoring students at the FAWE school, petitioning the government to provide social services to keep teen mothers in school, and campaigning against female genital mutilation across the region. Vanessa Bahati is the founder of the Jordan Foundation. The mission of the Foundation is to improve the lives of visually impaired children between the ages of three and eight years old. The Jordan Foundation helps visually impaired children and their families thrive by offering health and educational services, emotional support, and socioeconomic empowerment. Esperence Gasore is a nurse and founder of the NGO Rwanda Children and director of Rwanda Children’s Health Center. The Rwanda Children’s Health Center provides health services to poor and vulnerable families in Ntarama. Rwanda Children also provides social support to the community through education and entrepreneurship programs, clean water programs, and incoming generating skills programs. Since 2015, 13 women of courage have been recognized by the U.S. Ambassador to Rwanda. They include last year’s awardees, Chantal Munanayire, a successful businesswoman, and CEO of QUICK & C LTD, Ketia C. Kabanyana, president and founder of Dorcas Consolation Family (DCF), and Jeanne Francoise Gakire, a laboratory agent at Cyakabiri Medical Centre in Muhanga. In 2016, the award went to Agnes Twagiramaliya, a teacher in Nyamagabe district who has dedicated herself to educating youth for 36 years; Ms. Zulfat Mukarubega, founder of the University of Tourism, Technology and Business Studies (former RTUC); and Jeanne d’Arc Girubuntu, the only woman on Rwanda’s national cycling team. The first women to get the recognition were Chantal Ingabire, who leads a team of more than twenty lawyers, investigators, and social workers at International Justice Mission to secure justice for Rwandan children who have suffered sexual assault; Jeanne Mwiriliza, the founder of Tubahumurize Association; Liberatha Mukasine, who overcame the loss of her husband and three children in 1994 to become a successful cassava farmer in Ruhango district; and Xaverine Mukamunana, the founder of Jyamubandimwana Association. The U.S. Embassy congratulates these women on their great work and commitment to serve.